NJBIA President & CEO Michele N. Siekerka, Esq. issued the following statement on June 1 regarding Governor Murphy’s signing of out-of-network insurance legislation (A-2039/S-485). 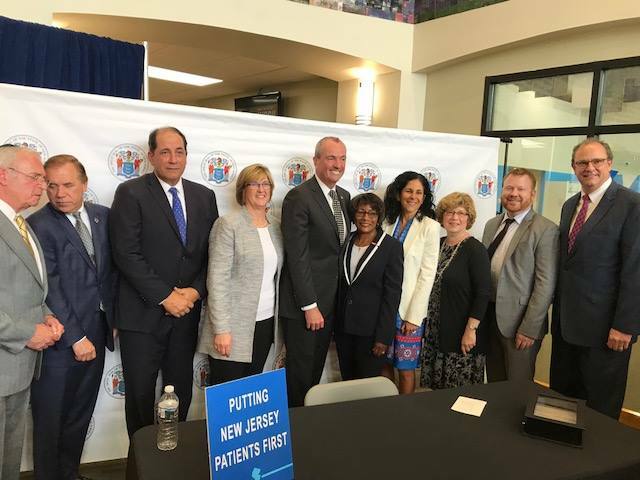 “This legislation signed today by Governor Murphy is a fair solution to the difficult long-standing problem of how New Jersey healthcare providers bill patients for out-of-network medical services. “It’s a solution that is fair to healthcare providers and consumers alike because it strikes a balance between providing reasonable compensation to facility-based providers, while protecting consumers from unexpected, non-negotiable bills that drive health insurance premiums higher. “The ‘Out-of-Network Consumer Protection, Transparency, Cost Containment and Accountability Act’ will ensure that consumers receive advance notice if a provider is out-of-network. This includes disclosures by providers and facilities about network status, potential financial responsibility, description of the services and an estimate of the cost. “This act also provides for fair resolution of disputed charges by limiting what consumers would have to pay out-of-network providers. In some cases, it creates an arbitration system to resolve healthcare billing disputes when the insurance carrier and provider cannot come to a negotiated agreement. “This legislation will bring much-needed control to the cost of health insurance. These costs have risen to an average of almost $22,000 a year for family coverage and threaten the ability of employers to continue to provide quality health benefits to their employees. The legislation was sponsored by Assembly Speaker Craig Coughlin, D-19; Assemblyman Gary Shaer, D-36; Assemblywoman Pamela Lampitt, D-6; and Senator Joseph Vitale, D-19.